Tough break. Legal hit. No sympathy. 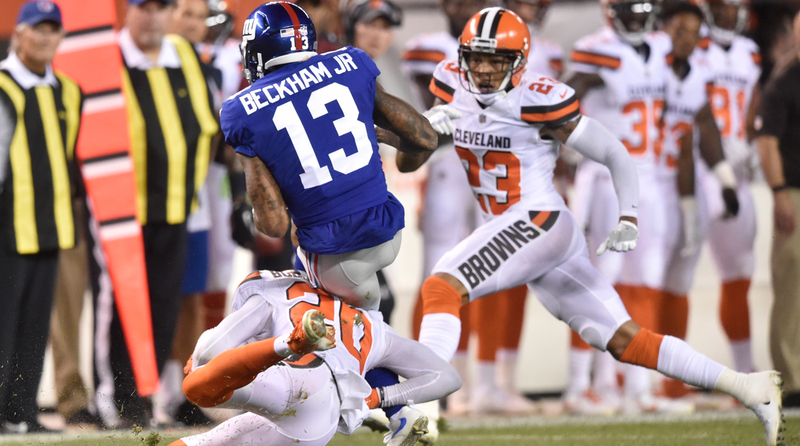 On Monday night, Cleveland cornerback Briean Boddy-Calhoun took a flying dive into Beckham’s legs in the Browns-Giants preseason game, his right shoulder caving in Beckham’s left leg. The diagnosis was not a knee injury, but an ankle injury, with Beckham avoiding major damage. I don’t want to be too cold about this. The Giants, and the NFL, are better with Beckham playing. I hope he’s active in Week 1 against Dallas, and I hope he’s the miracle-man he so often is. Odell Beckham Jr. suffered an ankle injury on this hit by Browns cornerback Briean Boddy-Calhoun on Monday night. The background: Boddy-Calhoun is very likely but not certain to make the Browns’ 53-man roster as the fourth cornerback. He isn’t so solidly entrenched on the roster that he can pull up when the league’s most precocious young receiver reaches for a pass and prepares to turn upfield for a big gain, and hit Beckham only between the upper thigh and sternum. If Boddy-Calhoun doesn’t make the play, he jeopardizes his job. I asked two great recently retired defensive backs, Woodson and Ronde Barber, about the hit Tuesday. Barber said it was perfectly legal and, mostly, didn’t have a problem with it. Barber said when a receiver couldn’t see him approaching, he’d try his best to avoid contact to the receiver’s mid- or lower-leg. Understandable—and fair. Barber said often on plays like this, the defender can’t predict exactly where he’s going to make contact with the receiver because it happens so fast. Woodson was significantly less equivocal. The NFL has made it a foul for a defensive player to contact a ballcarrier in the head or neck area when the ballcarrier cannot defend himself. But there is no league statute that prevents a defender from contacting any area of a receiver’s leg when trying to bring him down. In this case, it’s arguable that Beckham was a defenseless player; he couldn’t see that Boddy-Calhoun was coming at his legs. But if Boddy-Calhoun went to Beckham’s shoulder or above, the Giants would have a case. Boddy-Calhoun went low. So this was a legal hit. Was it ethical? That’s a good argument. But I would ask this: If the league wants the kind of hits that Boddy-Calhoun put on Beckham to be illegal, shouldn’t that be a rule? Every year, the rules-making/refining Competition Committee spends two weeks before the league meetings discussing what should be done to make NFL games less dangerous and more fair. They look at hit after borderline hit and try to divine what makes the game better. If hits like Boddy-Calhoun’s should be banned, then this ultra-safe-thinking committee would have advanced a rules proposal to the league owners by now. I’ll tell you why they haven't. Football is a dangerous game. If the NFL rules you cannot bring down a ballcarrier except by contacting him, say, from the upper-thigh region to the sternum, that would give the offense a significant edge and put defensive players at a severe disadvantage. 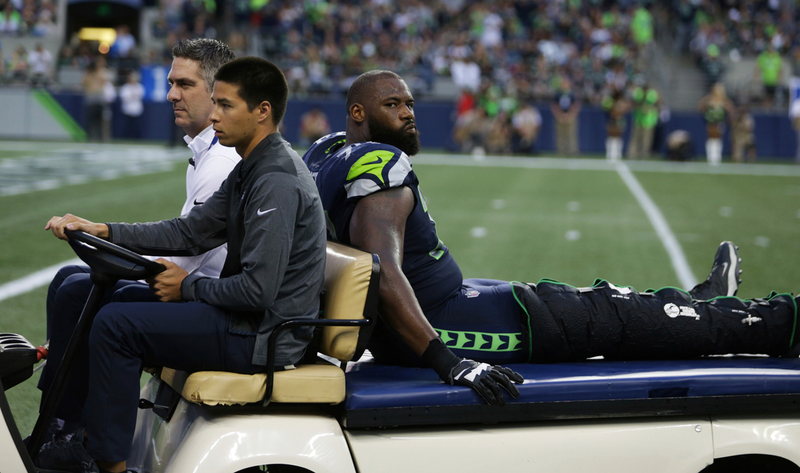 The Seahawks lost starting tackle George Fant to a season-ending knee injury suffered during a preseason game. I know scrimmages have been around for awhile but your recent article about the joint practice between the Texans and Pats made me wonder about the seemingly increased number of controlled practices/scrimmages and the future of preseason games. Since there isn’t as much contact in training camp any more and teams really don’t like seeing their prized assets get hurt in preseason games (my Seahawks are currently lamenting the loss of left tackle George Fant) do you foresee the possibility of the NFL someday reducing the number of preseason games and instead replacing one or two of those with controlled scrimmages and practices against other teams? You could still see how your team is stacking up against certain competition, get players game-type reps and it would seemingly reduce the risk of injuries. Or is the revenue generated by a full blown preseason game too much for owners to give up? There may well be other reasons not to do it but I hoped to elicit your thoughts. Absolutely. It was so interesting listening to Bill O’Brien in West Virginia last week talk about why the Texans and the Patriots were practicing for two days in a controlled environment. Instead of having players subjected to the whims and chance of preseason games, the coaches in controlled scrimmages can dictate exactly what they want to work on. Believe me, that appeals to a lot of coaches. I have said this for years: It is going to take owners who understand that by giving up a few dollars a year, with the subtraction of one preseason game, that they can do significantly better for their team on the field in preparing it for the season. After writing so disparagingly or Seattle's physical practices, a few weeks later you praise Pittsburgh for running similarly physical practices. You even mention that Seattle and Pittsburgh are the only two teams that practice that way. But with Seattle, it's a bad thing. With Pittsburgh, it's great to get back to that old-school football. I was most critical of Seattle for practices being so chippy and for the physicality leading to two skirmishes. There were no skirmishes when the Steelers practiced at full-speed. It was pretty much just a regular, very hard-hitting football practice. If I implied in Seattle that I didn’t think there was any place for physical practices in training camp, that certainly was not my intention. My intention was to point out the folly of Frank Clark and Thomas Rawls of the Seahawks basically starting fights instead of simply playing good, very physical football. Thanks for the info about the upcoming Dr. Z. book. The only thing better (way better) would be the announcement of his return to writing his column. This is definitely must- read stuff! I look forward to writing about Paul Zimmerman next Monday and hopefully bringing some of the messages from his book—Dr. Z: The Lost Memoirs of an Irreverent Football Writer—to you so you will be able to enjoy his life the way so many people have in past generations. Thanks to Triumph Books for publishing his life’s story and for believing that his story is worth reading for a new generation of fans. As an American, it saddens me as it does these athletes and I understand the remorse and even the anger associated with this injustice. As a veteran, however, I feel that to use this venue—the national anthem—as a platform for protest is misguided. I find it disrespectful to veterans, the families who lost loved ones and active duty military personnel who sacrifice for the right to stand and listen to the anthem, celebrating that we are Americans and we stand together. If the athletes stopped to consider this, then maybe they would find an even more effective method to protest. One that would unite us and not divide. Listen to my podcast—published early Wednesday—with Philadelphia wide receiver Torrey Smith, who is so reasonable and so sensible about why players today are protesting. I believe that it is incumbent on all of us to respect the wishes and the views of those who would protest against the anthem, because, very simply, we cannot be in their shoes. We cannot be in the shoes of their families. I think this is all about respecting the views and opinions of others. I spoke with Chris Long at length Tuesday while visiting the Eagles. He had a very interesting point. Because he has friends and associates who are veterans, he cannot kneel for the anthem. He respects his friends and associates too much to do that. But he believes that in a free country, people should be free to express their opinions the way they wish. That’s pretty much exactly how I feel. Seems to me there are several teams with elite franchise quarterbacks with suspect offensive lines—Seahawks, Giants and Colts to name three. If I were a GM with QBs such as these, I would make every effort to put together a top-flight offensive line. Why do you think this happens? The biggest issue that I see is that some general managers believe that lower drafted offensive linemen can be turned into stalwarts through training and good coaching. It’s kind of hard to criticize the Giants as a team that hasn't devoted enough energy toward the line when Ereck Flowers was drafted with the ninth overall pick to play left tackle. You can criticize the Giants scouting, but they do have two first-round draft choices on the line, and so clearly they should be playing better right now than they are. This is a very complex topic that has to do with coaching, draft choices and style of play. If you want to criticize one of those three teams, I would criticize Seattle. The Seahawks have simply not used enough high picks on a position of glaring need. 42,000 for two preseason games. The L.A. Chargers is shaping up to be a colossal failure. Can the Spanos family sell the team immediately or do they have to wait a specific period of time? I think it is very early to be declaring the death knell of the Spanos family and the ownership of this team. I believe that eventually the Spanos’ might sell, but that won’t be until some time after they get into the new stadium. Give this franchise a chance and I believe that if they win, that will solve every problem. If the Chargers have some better luck with injuries than they have had in recent years, they will surprise. Thanks for digging this out. I felt chills reading it same as when I was 10 listening on the radio. If Tony’s through, what will we do, who’ll carry them from here? 50 years later these lines from the ”Impossible Dream” album are still burned into my brain. You and me both. I wish I still had my copy of that album. It has disappeared in the many moves I’ve made over the years. But what really stood out in that season to me, was being in Fenway Park on the day after Tony Conigliaro was beaned. That was the one game I attended that year. And I still remember the palpable sadness walking into the park because of Conigliaro getting hit, but then euphoria of the Red Sox coming back for a 12-11 win. What a year. It sounds like you felt the same stuff that I did. Try it made with steamed soy instead of water. A barista turned me onto this. Makes it a bit fuller and better to me. Thanks for the scouting report. Will try it, but with almond milk instead of soy. Appreciate it.